15" laptop ideal for content creation and productivity with a numeric keypad. 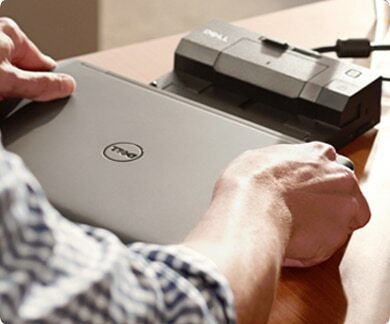 Dell’s most secure business laptops: Only Dell offers comprehensive encryption, leading authentication and leading-edge malware prevention from a single source. Dell DDP|E protects your data across all endpoints, including external media, self-encrypting drives and in public cloud storage. DDP | Security Tools offers advanced authentication options to help you keep unauthorized users out of your data. Dell takes a new approach to malware prevention by protecting your data and users from all untrusted content with DDP | Protected Workspace. Outstanding reliability you can trust: More durable than its predecessor, and part of the most durable laptop family, the new Latitude 15 5000 Series undergoes extensive testing to ensure it can survive your everyday workday and features premium materials like enhanced hinge structure and optional magnesium alloy. Enjoy a consistent experience with E-Family docking and common power adapters for the 6th generation of Latitude. Plus, they’re backed by enterprise-level service and support for peace of mind. TECHMEN brings you the best price for Dell Lattitude E5550 Core i5 5th Generation 500GB Hard Drive 4GB RAM with express shipping all over Pakistan.